Anyone can design a building that stands up. But it takes a structural engineer to design one that BARELY stands up. Calculating the stresses in a member, and determining if they are within it’s capacity, is one of the main tasks of a structural engineer. Often this is accomplished by making simplifying assumptions that allow the use of relatively simple mathematical methods. But for anything other than the simplest shapes under the simplest loading conditions, these approximations don’t work. In these situations, the difficulty of calculating stresses ratchets upward, and requires solving second-order partial differential equations. Today, thanks to modern computers and tools such as finite element analysis, solving these sorts of problems has become relatively trivial. But before these aids existed, complex stress problems were simply too difficult to solve mathematically. Because of this, alternative methods had to be devised for working out the stresses, methods that didn’t rely on solving intractable equations. One of the more ingenious of these was the soap-film method for calculation torsion stresses. Now consider a seemingly unrelated problem, that of a membrane stretched over an opening, and subjected to a small pressure on one side. Multiply your answer by 4S/p, and the equations are the same. Essentially, a stretched membrane is a graphic representation of the distribution of stresses in a section undergoing torsion. And because a soap bubble is a close approximation of a mathematical membrane, it’s possible to calculate torsion stresses simply by creating a soap bubble of the right shape, and measuring it. Well, “simply” might be a bit of a stretch. The process of measuring a soap bubble is actually fairly torturous. First, a hole in the shape of the section to be analyzed was cut in a metal plate. A circular hole would be cut in the metal plate as well, as a calculation aid*. A soap bubble was created in each of the holes, and a small pressure induced on one side of the plate caused them to deflect outwards. 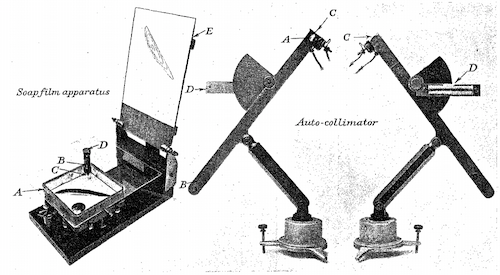 The slope of the bubble was measured with an autocollimeter, a device which bounced a ray of light off the bubble and then measured it’s deflection. The height was measured using a spherometer, a steel needle that would be incrementally lowered until it just barely touched the bubble. After enough such measurements were made, contour lines of the bubble could be drawn, and it’s exact shape could be determined. The method was, by today’s standards, fairly tedious. But it yielded a great deal of information. The value of the stress function at any location could be determined from the height of the bubble, the surface tension, and the pressure. The contour lines were equivalent to lines of shearing stress – the closer the lines were together, the higher the stress. 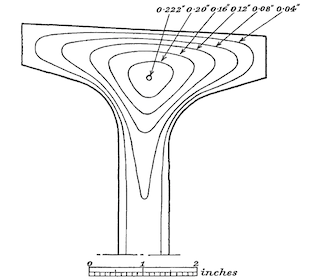 And the total torque in the section was simply a function of the volume of the bubble. Using this method, values for stresses could be calculated with an error of just a few percent. Of course, with the advent of computers and FEM, engineering tricks such as the soap film method have gone the way of the slide-rule. However, we should be reluctant to forget them. While modern methods are certainly quicker, something is lost when you don’t have to actually understand a problem to crank out a solution for it. The calculations required and intuition built by soap films and similar methods, though time consuming, gave insight into the problem that software-based solutions just can’t impart as effectively. *The circular bubble allowed the calculation of the tension in the bubble, based on the pressure. Putting both holes in the same plate guaranteed they would be subject to the same pressure. The circular hole also allowed for the calculating a ratio of the torques of the complex section to the circular section.